In which Chance speaks about Chicago, the Grammys, and staying independent. 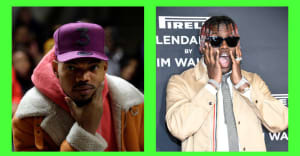 Chance The Rapper once shouted out Katie Couric on his Acid Rap track "Paranoia." Now he's sitting down to an interview with the Yahoo news anchor in which they discussed everything from his Grammy success to his vision for the future of his hometown, Chicago. They also found time for a game of Rock, paper, scissors too.